in europe we have a new law coming up in May, 2018. Its called GDPR and will probably fundamentally change what is allowed to store in terms of personal information. It would be great to get some feedback on what Communifire thinks about this. 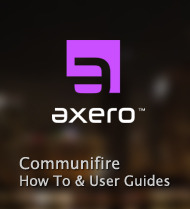 Max, from what we understand so far, Communifire provides the tools for you to manage all data that is related to a specific user. As an administrator, you can see all of the information a user has provided in their profile, you can edit and delete it, so can that user. All information that a user provides is recorded and tied back to that user. We will likely be publishing a document on our support site that details necessary topics related to this GDPR.